PONDY ART is also enormously honored to welcome Mr. Robi Ganguli to SHOOTING ANGLES. Mr. Ganguli is an internationally recognized photographer in his own right. But aside from that, he was an integral part of the development of photography in Pondicherry. He was part of the creation of the Photography Department of the Sri Aurobindo Ashram. And Mr. Ganguli introduced fine art photography to Pondicherry with his International Photography Exhibition – which ran for decades and showcased the best photographers chosen from thousands of entries across the world every year. So if you are interested in photography, this is your chance to meet the pros. 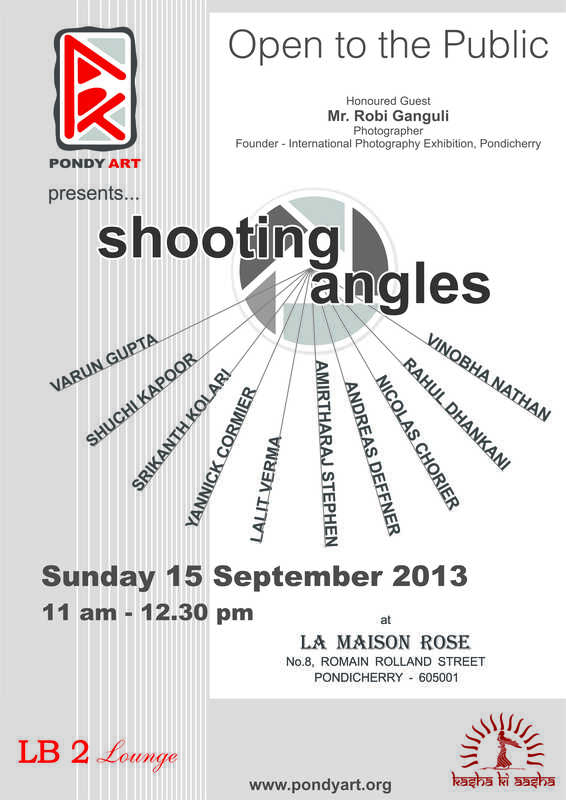 Join us Sunday morning, 15 September in Pondicherry at SHOOTING ANGLES. Reblogged this on Pondy ART.